In this lesson, we will learn how to find the values of interior angles of a polygon given the number of its sides and vice versa. Find 𝑥 and 𝑦 . Write an expression for the sum of the measures of the interior angles of a polygon with 𝑛 sides. What is the measure of the interior angle of a regular pentagon? 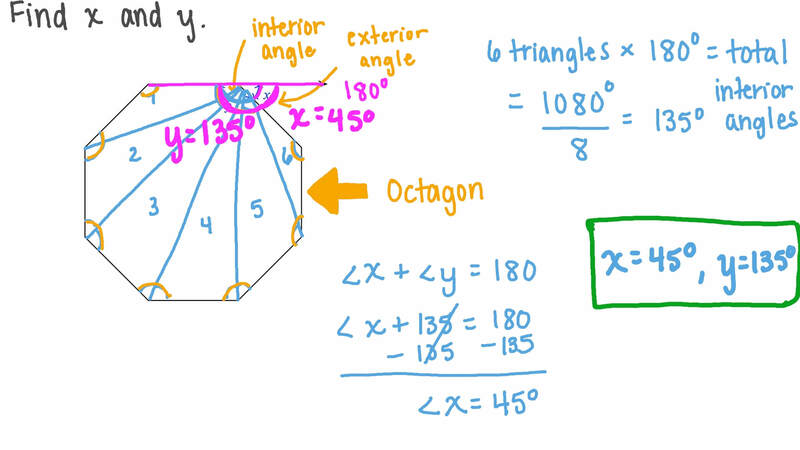 Find the size of one interior angle of a regular polygon that has 5 sides. Each interior angle of a polygon is 1 7 9 ∘ . How many sides does it have? What is the fomula for the measure of the interior angle of a regular polygon with 𝑛 sides? Shady finds a building that has a triangular base. If he were to walk around the building, finishing at the same point, in the same direction, how many degrees would he turn? 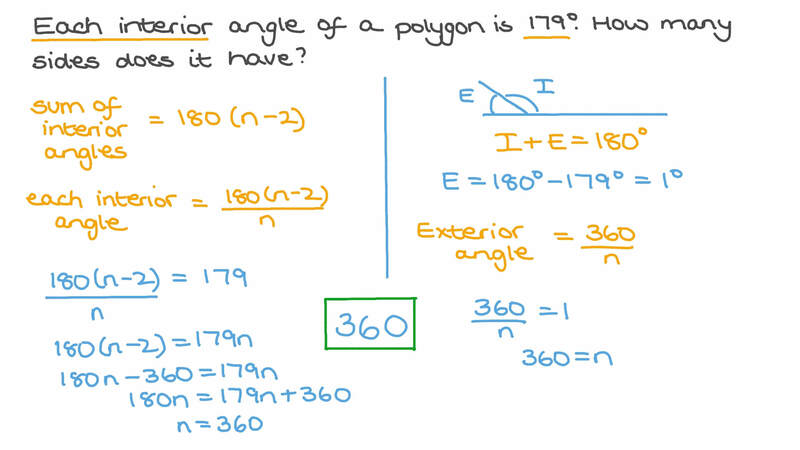 Determine, to the nearest minute, the measure of the interior angle of a regular polygon that has 30 sides. Each interior angle of a polygon is 6 0 ∘ . How many sides does it have? Each interior angle of a polygon is 1 4 4 ∘ . How many sides does it have?